The originally announced capacity was going to be 5000. But then the city had to cough up an additional ten million dollars for cost overruns and in the process of addressing that situation, the capacity was reduced to 4200. 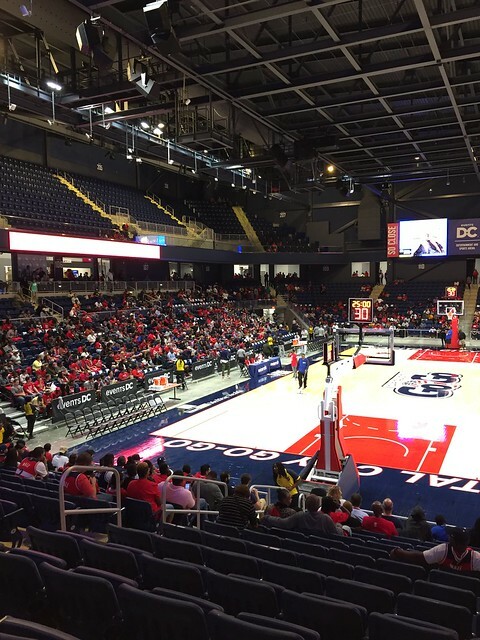 Leonsis's attitude was that the city was responsible for building the facility, so the city was responsible for coming up with the additional money. I assume at any time he could have dipped into his own billions for some pocket change to pay for a bigger facility. It's not like there's any shortage of vacant city-owned land surrounding the facility. I'm not sure it being 5000 rather than 4200 would have really changed the discussion. It actually looks like a fairly nice arena. Not great but not terrible. If they can fill it up on a regular basis, it might be fine. If it's only half full, then it's a problem but it's a problem wherever the arena is... What's their attendance been this year? Yeah, just for the sake of comparison, the place that's holding the knock-out stages of the FIBA World Cup right now only holds 5,100, but it feels like a proper basketball arena and it was absolutely rocking last night for the Spain-Senegal game. If Mystics games were like that 17+ times a year it'd be a big upgrade on what they seem to have been like in recent seasons. And people wonder why income inequality is getting worse. 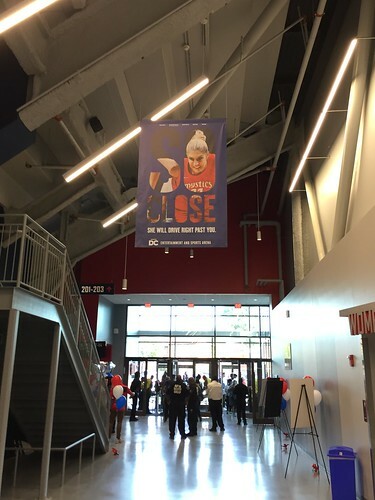 I was at the Mystics new arena last night for a Wizards open practice. I was NOT very impressed. Most, if not all of the seats are the ones that fold up. It reminds me of a glorified high school gymnasium with more seats. 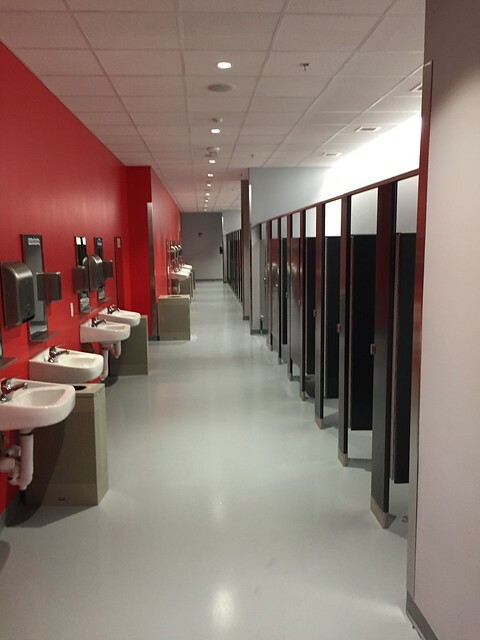 The seats are comfortable enough & the concourse, walkways, restrooms, etc,... were fine. The location is in a very bad section of Washington, DC, but the metro station is a few blocks away. The arena is basically in the middle of a residential area with (at this point) no retail, restaurants, businesses, etc,... That could change eventually, I'm not sure what is planned. 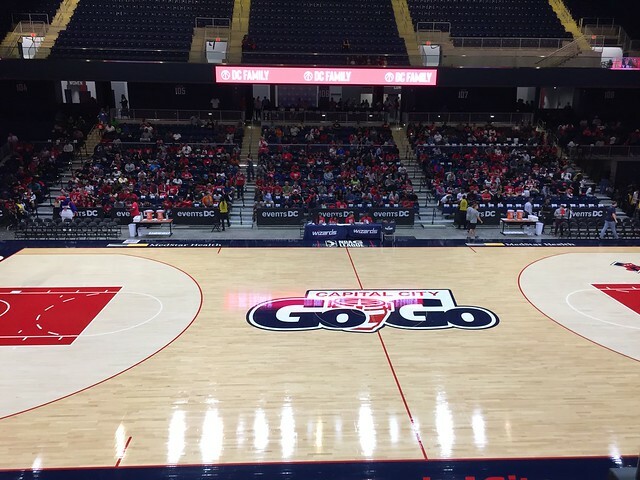 As for my impressions, I agree with goofy that the building itself is not "impressive", but I think -- when filled with Mystics fans -- this will be a rockin' home court! There aren't really any bad seats. Everything in the lower bowl is, as you see, pretty close to the court. The seats themselves are surprisingly comfortable for plastic, fold-up chairs. I'm 6'3" and I actually had a few inches of room between my knees and the row in front! And my friend and I both noticed that the seat width seemed a little more generous than back at Capitol One. There are only two (identical) food concessions, with your basic burger, drinks, popcorn, etc. Very uninspired, and if the arena is full, the wait times could be annoyingly long. One thing my friend and I noticed was that there appears to be more space allocated to the two Womens restrooms than the two Mens rooms. The pic above is of the largest of the two Womens rooms. The biggest downside (besides being a couple of thousand seats smaller than I think it ought to be) is location. Many long-time fans are used to the convenience of the Gallery Place Metro. Easy to get to on either the Red or Yellow or Green lines. This new place is accessible only by the Green line, and my recollection is that trains don't run on that line all that often. Wait times well into the teens or longer. The walking distance to the Metro isn't bad. And I was told that by the time games begin next season, there should be good lighting and security, making it safe for fans to walk back and forth between the station and the game venue. So it's the wait times, particularly post-game, that could be a deterrent for me to take Metro to the game. We're also used to there being lots of parking within a few blocks of the Cap One arena. (And as goofy pointed out, there's no retail around the new place.) At the moment, there are only two very small surface lots. Though, I understand work is underway to build a parking garage and additional lot capacity. It definitely will be needed, because those two lots couldn't possibly accommodate all the fans driving to the games. As for getting to those lots, for me, and many others, the drive to the arena -- particularly during rush hour on a weeknight -- is going to be a MAJOR headache and very time consuming! I'm hoping for lots of Saturday and Sunday afternoon games on next season's schedule! I think the difficulty of getting to the new arena will cause some long-time fans to (regretfully) stay home. 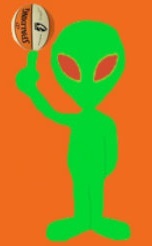 However, I fully expect that the team will pick up new fans from the surrounding area. For way more than half the lower bowl, the prices for season tickets, in my opinion, are very very reasonable! You can get a really good STH seat on the sides for $30 per game ($525 for the entire season); and you can get a quite decent STH seat in the end zone for $12 per seat (($210 for the season). I sat down in one of the $12 seats, and decided this location (if you're on a budget) would be an excellent value and an enjoyable place from which to watch a game. There are also STH plans more expensive, as well as in between the $30 to $12 lower end. 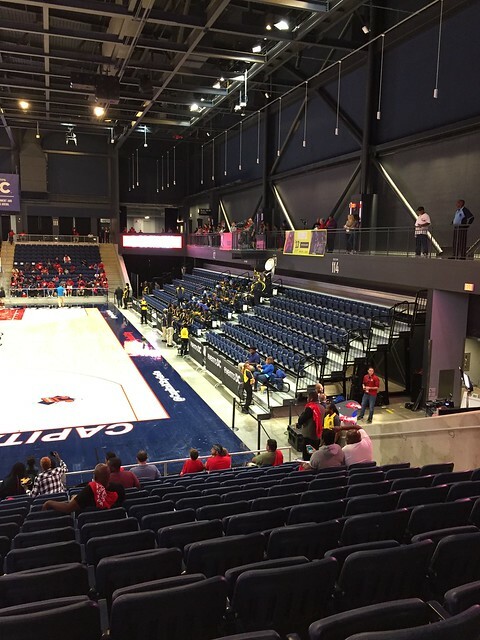 With many reasonably priced STH plans available, I expect that, if you live nearer to the new arena, you may be tempted to hop on the Mystics bandwagon. I hope the place fills up, as I expect it will. This small venue, when packed with home team fans, should be loud, close to the court and provide a real boost to the home team. I don't expect to make it to many games (because of the travel hassle) but I will go to some . . . and I am really looking forward to it! For the pictures it looks very nice. Leagues better than what Westchester CC looks like. If the Liberty are going to stay there long term, maybe they can take notes from Monumental. Also, Meesseman looks much improved in the World Cup. Be interesting to see how the Mystics add her back next season. Does Delle Donne slide over to SF? Or does Emma become the front-runner for 6th woman? I think they have a problem. If I am Messeman, I am not coming to the US for the summer to be a damn bench player. And DelleDonne is much better at the 4 than the 3. It's hard to imagine this team as successful as this past season when their two best players - by far - need to play the same position. I continue to think they should shop Messeman and see what they can get for her. I am not sure any trade would be able to really work, but it's worth a shot. It is pretty crazy how strong the 4s in this league are. It is such a stacked position. That said, Chicago, for example, would probably love to make a trade for Messeman. Meesseman would be a huge asset to land in either Chicago or Phoenix, two teams in need of a starting PF. Meesseman to Phoenix for the #8 pick & Gulich? Meesseman to Chicago for the #4 pick? I do think a "big" lineup is a possibility and having Sanders at the 5 over Thomas helps on both ends of the floor. Mystics also struggled with rebounding often this season so playing 3 bigs could help with that too. I don't see it as the starting unit though, especially not if Emma misses camp. And there's nothing to suggest that Emma would pout if she came off the bench. She's always been a team-first player. Picks don't do anything for Washington. Yes. I still don't get what is wrong with being able to have star caliber players off your bench, like Meesseman, etc. Looks like the TV camera will be on the small side and show the large side. Trading Emma is a non-starter. When Emma arrived, Coach T reached out to the Belgium Embassy and helped her connect with the Belgium community here in DC. Emma's relationships with those individuals and one particular family have helped her adjust and enjoy spending her summers in Washington. A trade to another city might mean she decides to stay home in Europe permanently, instead of simply taking a year off. It's a shame Meesseman plays the same spot as Washington's other star player. Mees/EDD can work, and may even work well enough to produce a title-challenging team, but I think we've seen enough at this point to know that they're both best off at the 4. Any lineup featuring both of them is always going to require some element of manipulation to get it to work. Of course, I'm sure there are Belgian communities in other cities in America. It might work out if she gave it a chance, but the uncertainty is always going to reduce her trade value even if she agreed to try it initially. I'm assured Thibault doesn't want to trade Meesseman and he'll make it work. Start both of them with EDD at SF. At the 5 minute mark, sub one out and use a rotation the rest of the game. Not in favor of playing Meesseman at center. Why would we not keep the starting 5 from this year? She can come off the bench and still get plenty of minutes. She and DelleDonne can't both get plenty of minutes at the position in which they are more effective. There is a reason that Bill Lambeer came into this league and won three titles. He had no sentimentality when it came to player movement. He knew that players were assets, and you need to leverage them to get the best return you can.